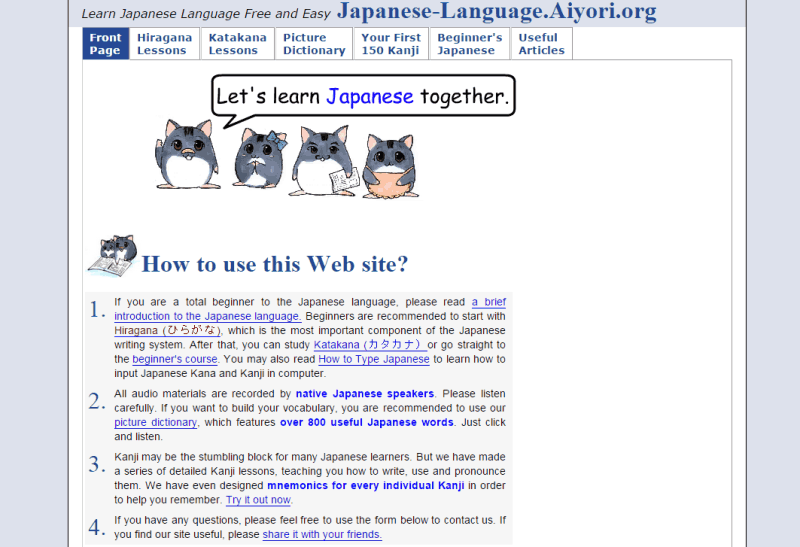 Here is a list of websites to learn Japanese Online. These websites are efficient enough to teach you Japanese from basics. 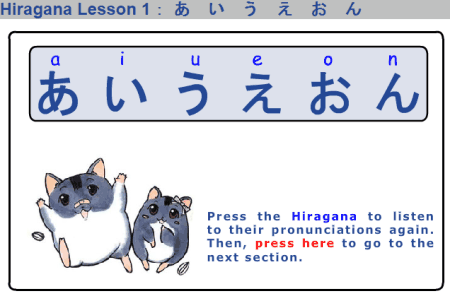 Learn to read, write, and speak Japanese with correct pronunciation from these websites. Are you a beginner at learning Japanese? Are you already learning Japanese language? These websites will help you in either case. 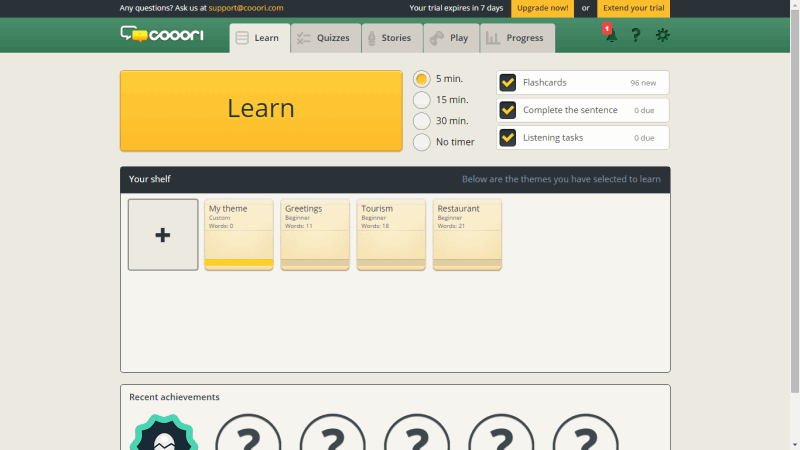 Language tools like Flashcards, Language games, Quizzes, Video tutorials, etc. can be found on these websites. Build your knowledge in Japanese language by learning new words, phrases, sentence formation, basic and advanced grammar with examples. Japanese is spoken majorly, and is the National language in Japan. Spoken by more than 125 million people, Japanese is categorized as an East Asian Language. Apart from Japan, it is also spoken in many other countries and places, like: The USA, Brazil, Hawaii, and Korea. 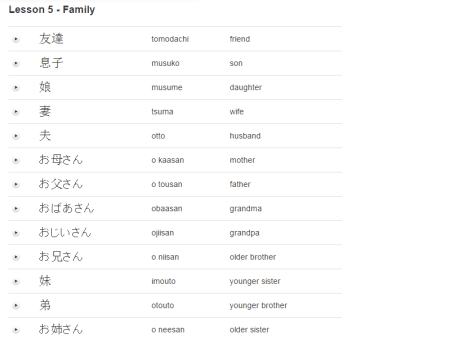 Busuu is an awesome website to learn Japanese Language. Learn Japanese right from the basics, or learn as an intermediate learner. You can also take the traveler course if you wish to travel Japan. 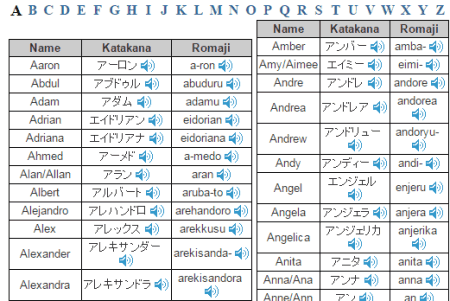 The course is totally supported by audio playback, which helps with learning Japanese pronunciation. Signup and begin learning. You can also checkout the list of best websites to learn Chinese Language, Korean Language, and Russian language. 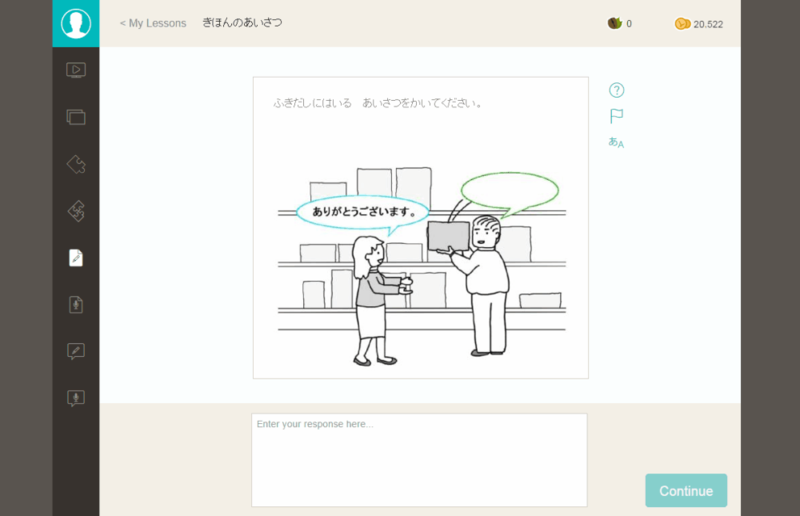 Practice: You can chat with an online native Japanese here, and learn Japanese from them. 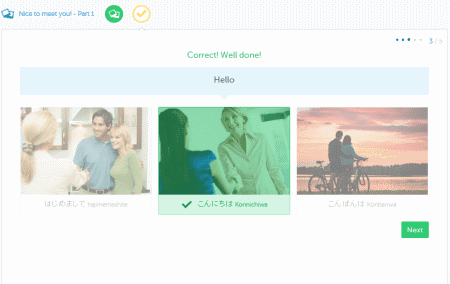 This lets you practice Japanese, and you can also help the online member by correcting their English. This is one of the best way to learn Japanese. 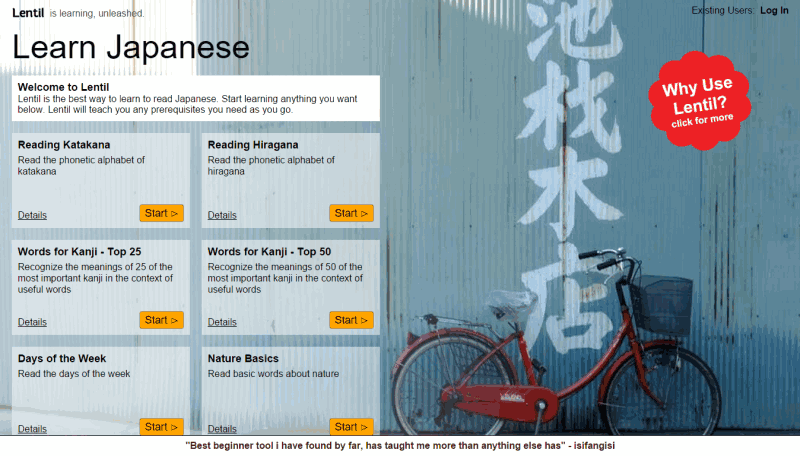 Vocabulary: Learn new Japanese words in this module, and practice them. All of these modules and lessons are supported by audio, so you can learn to speak Japanese as well. 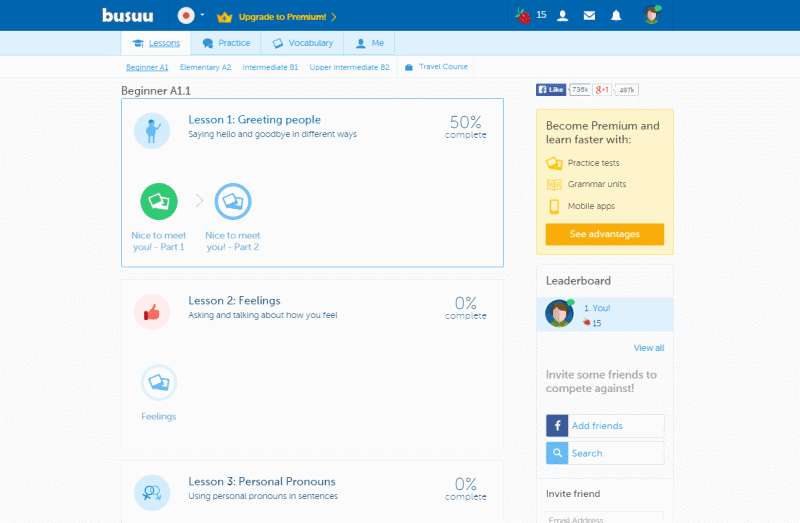 Busuu follows one of the best ways to teach language. After you learn every lesson, you can take a little test to check your progress. At the end of every module, you are given an online certificate as well. 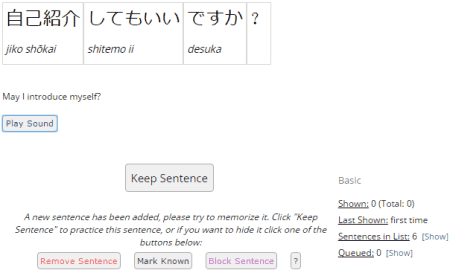 Japanese language course is available on Livemocha.com for free. 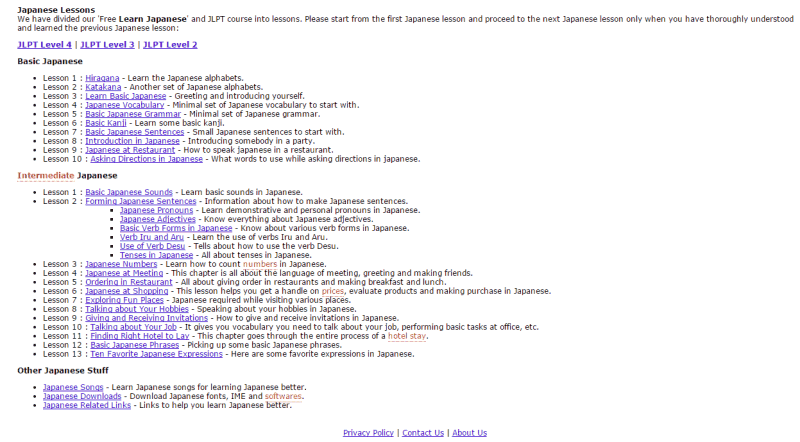 Begin to learn Japanese language from basics. 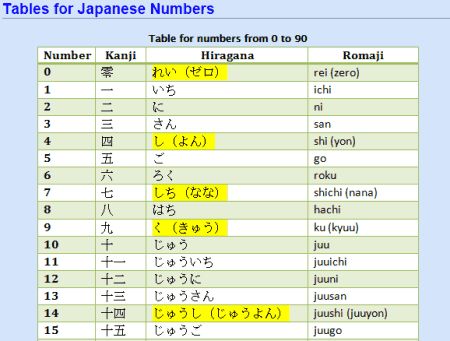 Learn Japanese numbers, alphabets, vocabulary, and much more. All of this is supported by audio and video playback. After learning the basics of Japanese language, you can move on to complex lessons, such as sentence formation, grammar, and pronunciation. You need coins to unlock lessons, you get complimentary coins at the time of sign up, and you can also earn coins as you move forward with the lessons. Learnalanguage.com provides free course to learn Japanese language. The website requires no sign-up to learn Japanese. 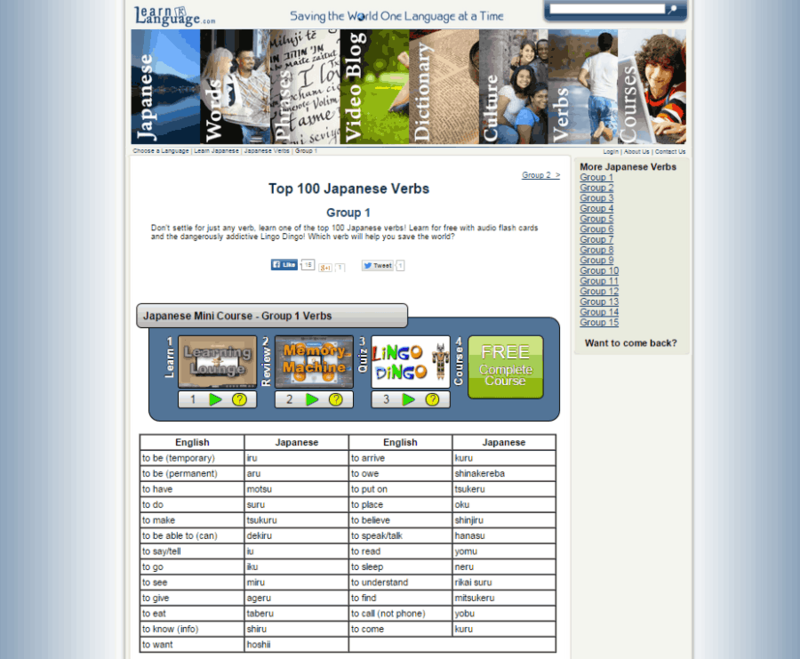 The Japanese words, phrases, and verbs sections have vast lists of contents. 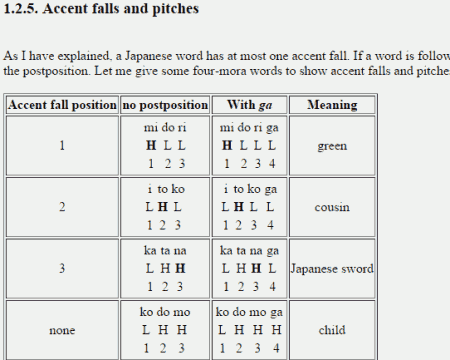 These contents are audio supported which makes it simple to learn actual pronunciation of Japanese words and phrases. You can also look up the Japanese dictionary and Japanese language learning blogs for thorough study of Japanese language. Learn more about the Japanese language, and Japanese cultural information in the “Japanese Culture” module. 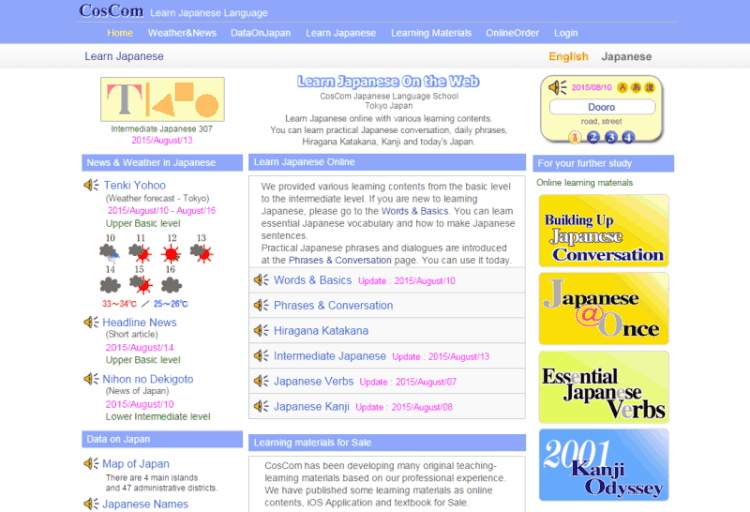 Japanese language learning course is available for free on Loecsen. Listen and learn from translation of general conversations, and phrases. A vast collection of phrases are available and categorized into different sections. These sections are based upon different situations you might face, like: introduction, taxi, hotel, airport, restaurant, numbers, etc. The image illustration helps you to understand any translation of a conversation/phrase in a better way. 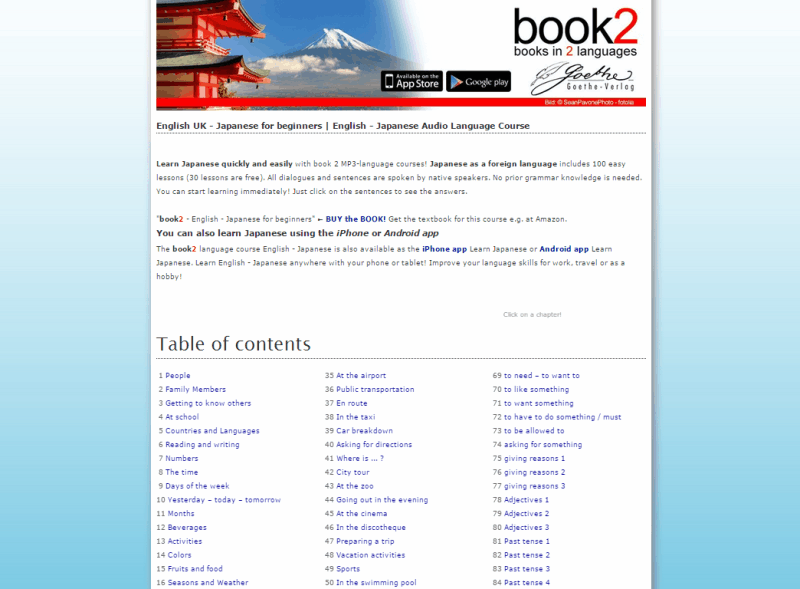 Download the course in PDF and audio format for free to learn Japanese, while you are offline. Learning Japanese language can be a tough job, but Digital Dialects helps you learn Japanese language pretty easily. 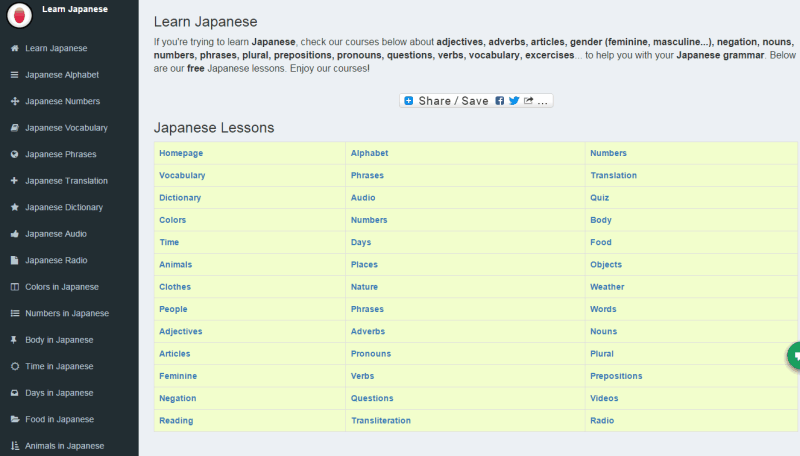 There are 20+ modules in the Japanese language learning course. 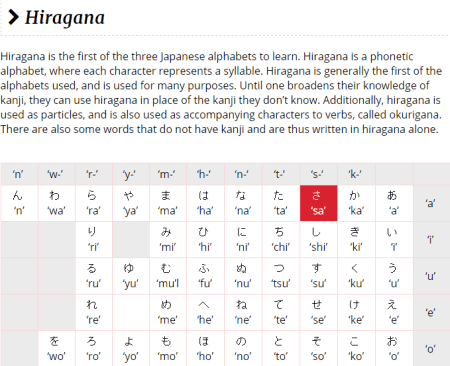 These modules will teach you Japanese alphabets, vocabulary, phrases, grammar, and much more. 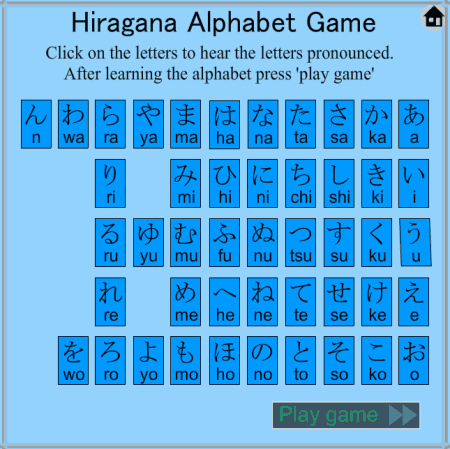 You can play language games, and take quiz to polish your Japanese language abilities. This website has one of the best resources for learning Japanese online. 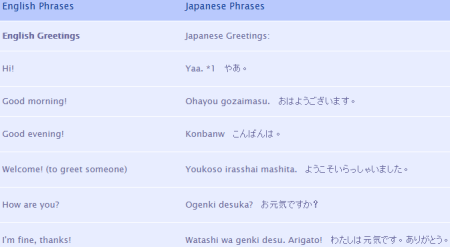 You can learn the basics of Japanese language for free at this website. 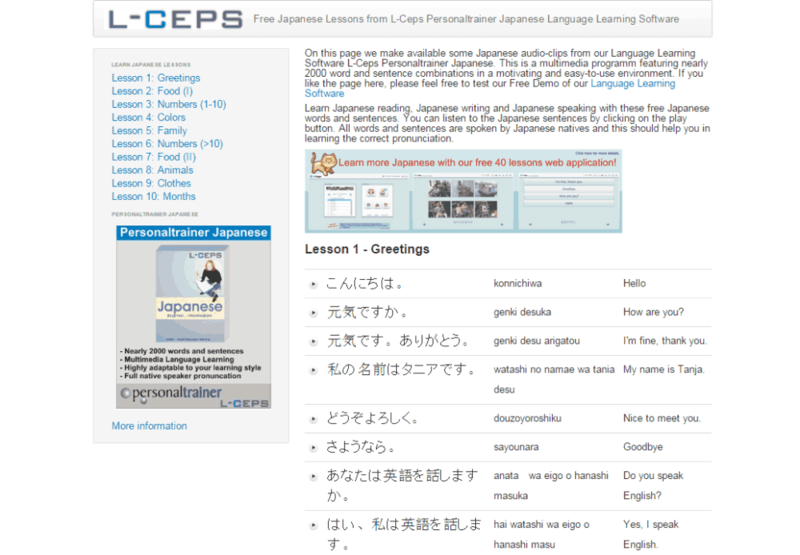 L-ceps provides translation of basic words, and phrases. The resources to learn Japanese language are divided into 10 lessons. Each lesson carries some words and their translation. The translations of words and phrases are supported by audio playback. Once you are done learning basics, move on to another advanced course in Japanese language. 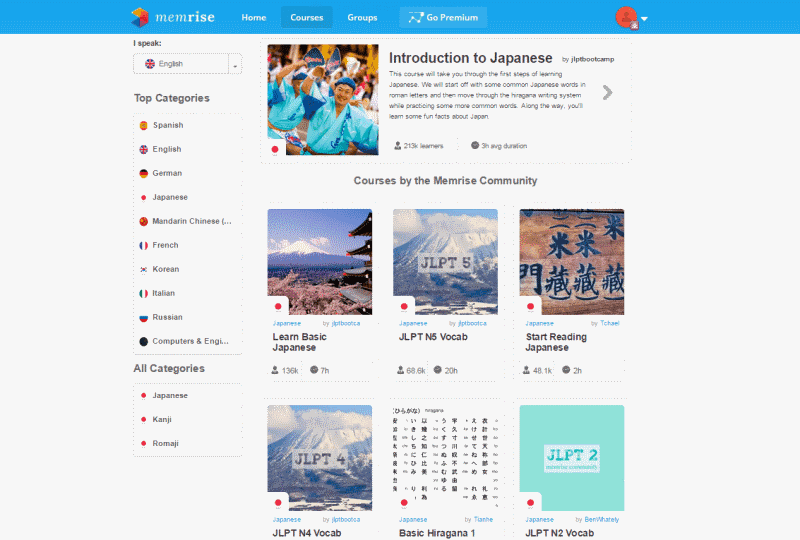 Memrise is an online learning platform where you can learn Japanese language for free. There are different courses available here based on both Kanji and Romaji Japanese. You will find a number of lessons to teach you Japanese language. These lessons are categorized to teach you Japanese alphabet, script, vocabulary, grammar, phrases, sentence formation, pronunciation, etc. Along with the lessons' names, you can also view the number of learners of that lesson, and the duration of the lesson. You can also create your own lessons in a language you know, and help others. Apart from language courses, you can also find courses in Arts, Literature, Maths, History, Geography, Professional Courses, and much more. 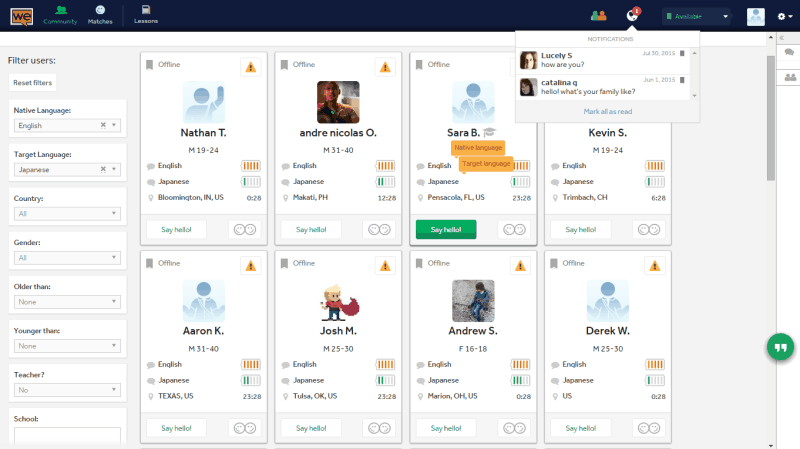 FluentU provides free online Japanese learning course. As soon as you sign up, the website asks about the level you want to begin with. You can learn Japanese as a newbie, elementary learner, intermediate learner, upper intermediate learner, or advanced native learner. Go through different audio supported lessons. These lessons will teach you Japanese characters, words, phrases, vocabulary, grammar, and everything else. For a better learning experience video tutorials are also available on this website. 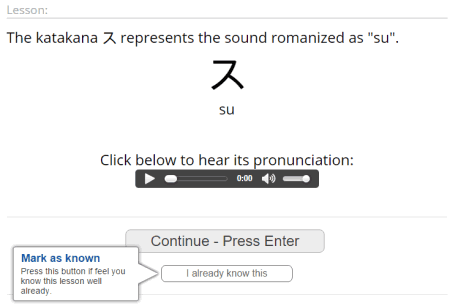 ilanguages is a place where you can learn to speak Japanese easily. 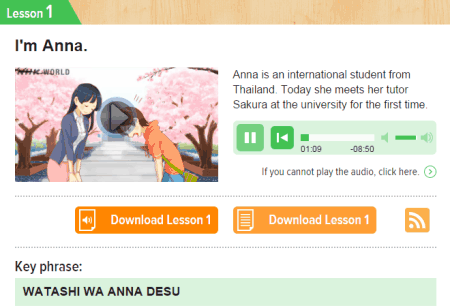 It has audio based lessons in Japanese Vocabulary, Phrases, and Grammar. The other two modules on this website are Flashcard, and Quiz. 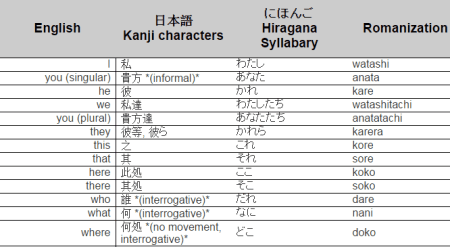 These sections are to practice, and strengthen your Japanese. 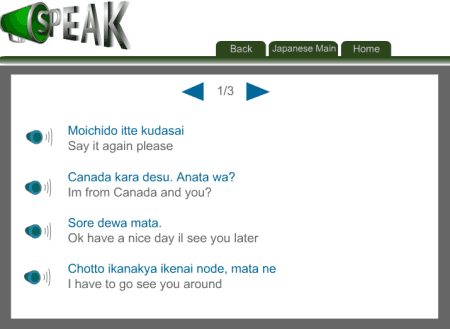 Speak is a totally conversation based website to learn Japanese language online. The best way to learn Japanese is by listening to Japanese, and practicing it. This website has a collection of phrases and conversations that you may have to use during different situations. The situations are rendered with the help of animation. This rendering makes it even easier to understand the phrases and situations. These situations include: Introduction, shopping, home, hotel, beach, bar, taxi, market, bank, etc. With 100 lessons in Japanese language, Goethe-Verlag is a resourceful place to learn Japanese language. 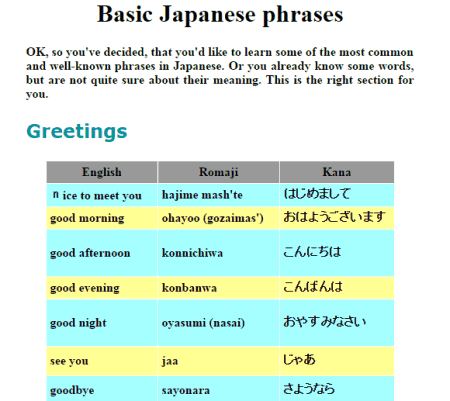 Start learning from the basics of Japanese language. The lessons are majorly based on Japanese Vocabulary, and Phrases. Listen to their translation, and practice to learn Japanese language. These lessons are based on different situations, and chapters from Japanese grammar. 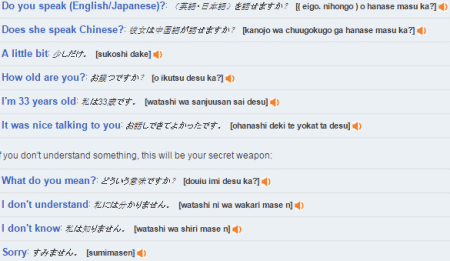 WeSpeke is a chat based website where you can learn Japanese for free. All you need to do is set your language preference, along with other preferences, like: Country, Age, Gender, etc. The website filters out online and offline compatible members. 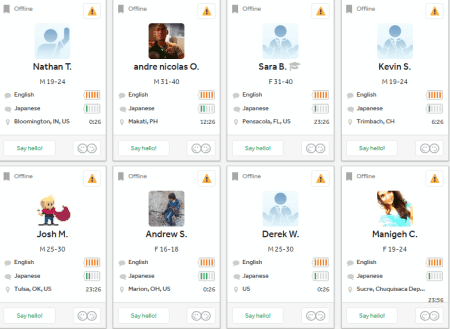 Go select a member, and start chatting with them to learn Japanese. You can also set your interests, this helps to sort out the best learning match for you. 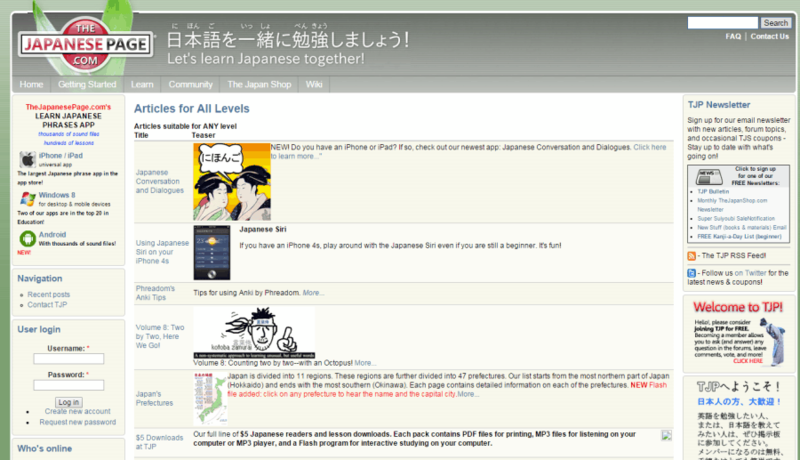 This wonderful website can be used to learn Japanese, and teach your native language as well. Antosch-and-lin.com is a website where you can learn Japanese with the help of flash cards. Choose a time span for which you want to learn Japanese, and select your level in Japanese language. 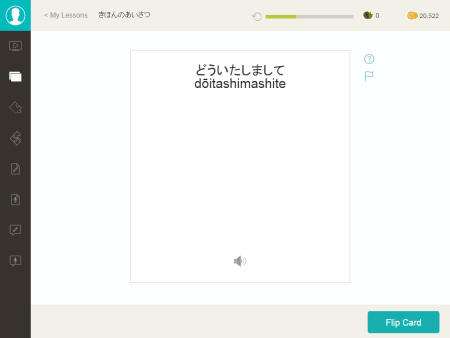 The website will show flashcards based on basic Japanese words, and sentences. As you move further, the level of words and sentences gets difficult. The flashcards appear randomly. These flashcards are supported by audio as well. 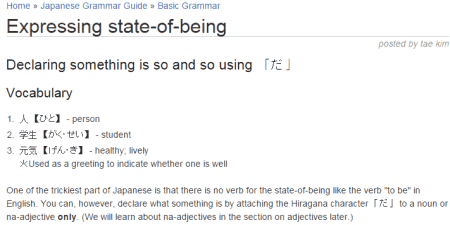 Grammar: This section has a short and important lesson on Japanese grammar. Words & Phrases: It has 3 levels of Japanese Words and phrases, with an additional vocabulary lesson. Videos: A series of Japanese language tutorial videos, which will help you with practicing and learning Japanese pronunciation. History of Japan: A detailed module with history of Japan from 14000 BC. Japanese culture: Japanese culture and ethics explained. MyLanguages has more than 40 lessons in Japanese. Begin to learn basic Japanese and move on to advanced lessons. Topics included in these lessons are Japanese alphabets, numbers, grammar, vocabulary, phrases, etc. All of the lessons are supported by audio playback; just hover the mouse over an object to listen the audio. Other lessons include educational videos, quiz, radio, and transliteration. 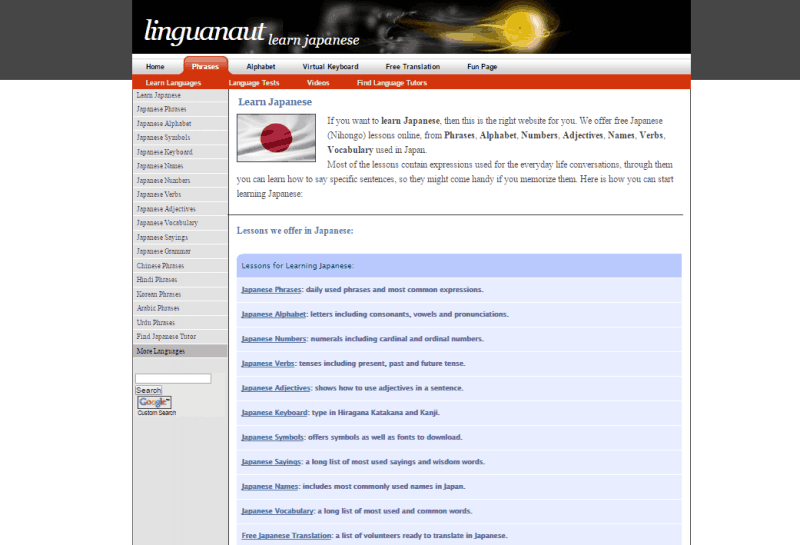 Linguanaut offers free course in Japanese language. 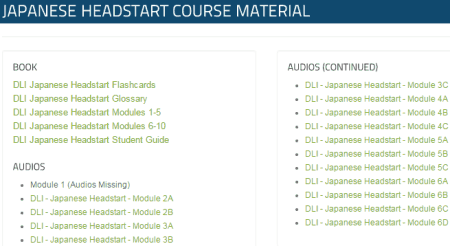 The course includes 11 lessons in Japanese, all supported by audio playback. The lessons include: Japanese Phrases, Alphabets, Numbers, Verbs, Adjectives, Keyboard, Symbols, Sayings, Names, Vocabulary, and Translation. The grammar lessons are explained pretty neatly with examples. Japanese script has been used in the lessons as well. 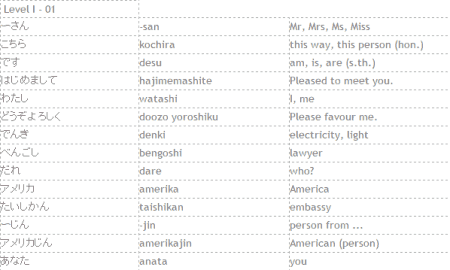 The list of Japanese Vocabulary is pretty extensive, and covers a broad area. 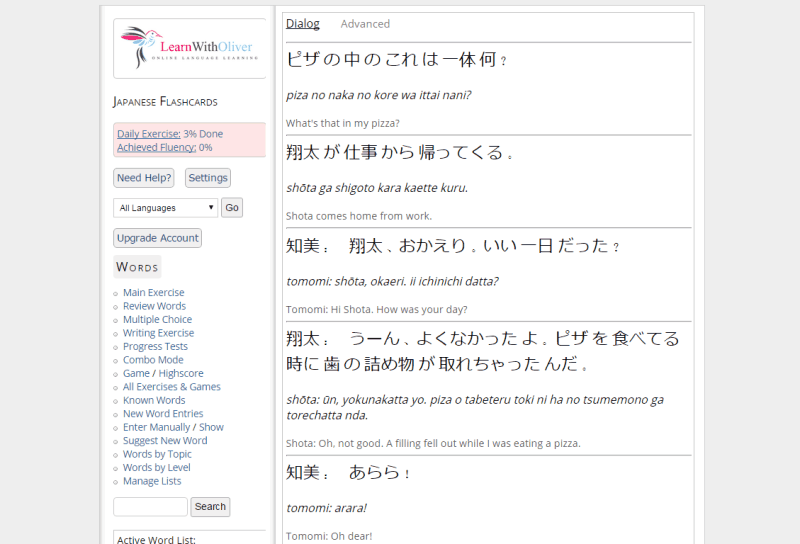 101Languages is another decent place to learn Japanese online. This website has 30+ sections in Japanese language. These sections include lessons, lists, and language tools. Begin learning from Japanese alphabets, vocabulary, and useful phrases, along with pronunciation. The vocabulary and phrases section is based on different situations, like: time, transportation, money, eating, bars, shopping, driving, etc. The useful language tools available on this website are: Japanese radio, Vocabulary games, Japanese keyboard, Quick translator, Flash card, Accent & intonation, etc. 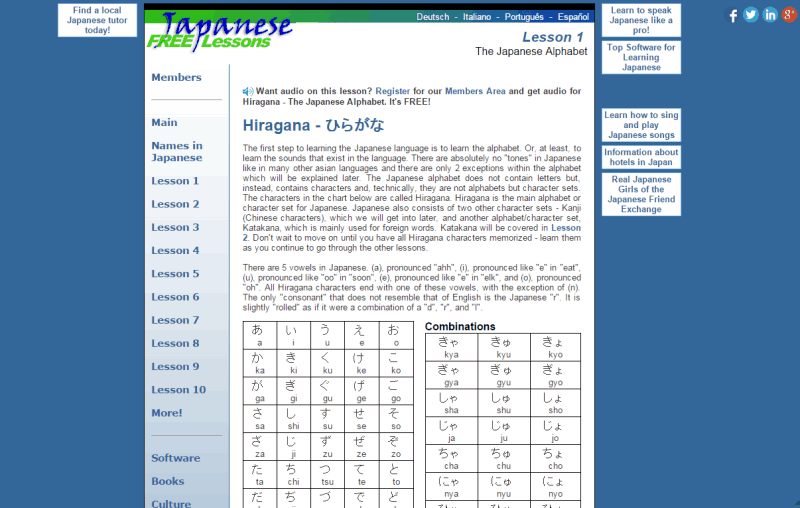 With 10 lessons in Japanese, Free Japanese Lessons is a good website to learn Japanese language. The course starts with a little introduction to Japanese. 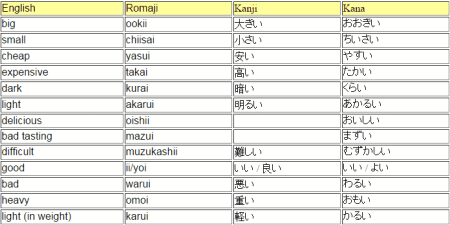 Later comes a separate module with lists of names, and their Japanese pronunciations. 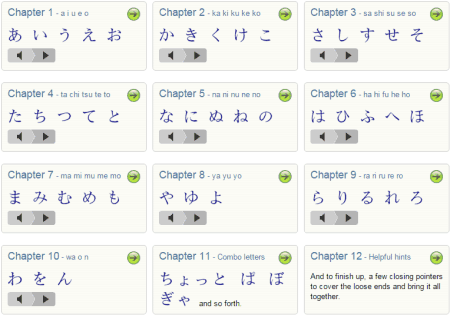 The lessons start from lesson 1, where you start learning with Japanese characters. Later the course advances with grammar, phrases, sentence formation, etc. Audio support is only available if you sign up for the website. Sign up is completely free. 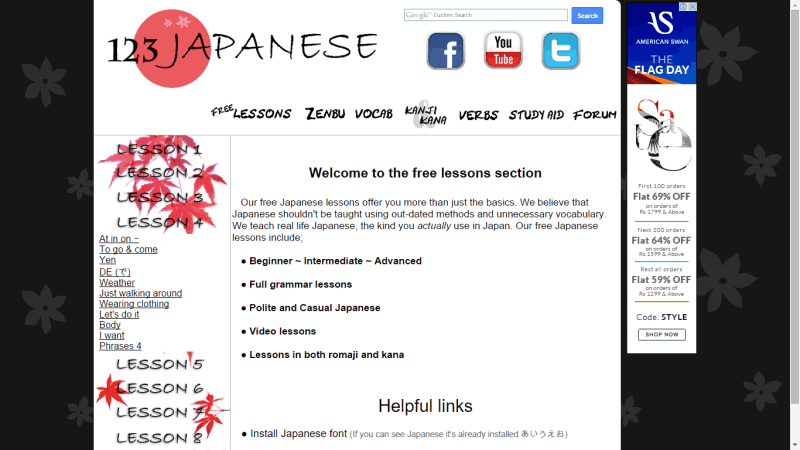 Teach Yourself Japanese with this awesome website which has substantial Japanese language learning material. There are 9 lessons available through which you can teach yourself Japanese. These lessons include Introduction to Japanese, Japanese characters, Numbers, Greetings, Basic Grammar, Vocabulary, and Dialogues. You will find these lessons subdivided into different topics, explained neatly. 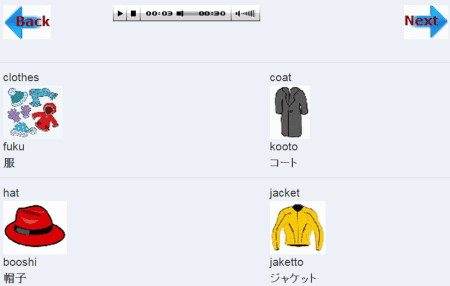 You also get audio playback for these lessons, making it possible to learn Japanese pronunciation. Live Lingua is a PDF and audio based Japanese language learning course. Visit the website to download the PDF and audio. 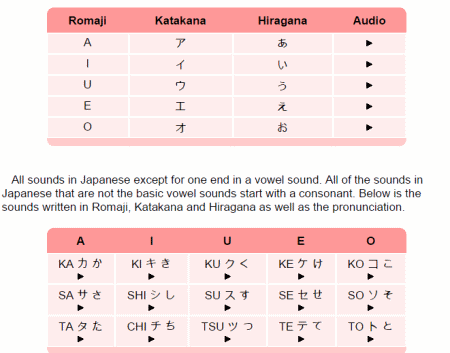 Play the audio while you go through the PDF to learn Japanese. The course starts with a basic introduction to Japan and its culture, advances to basic Japanese, and then advanced level. The audio and the PDF material are synchronized. 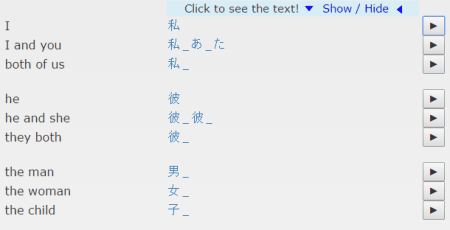 The complete guide: This section has content to teach you Writing in Japanese, basic grammar, numbers, direction, formal language, expressions, phrases, and other important lessons. 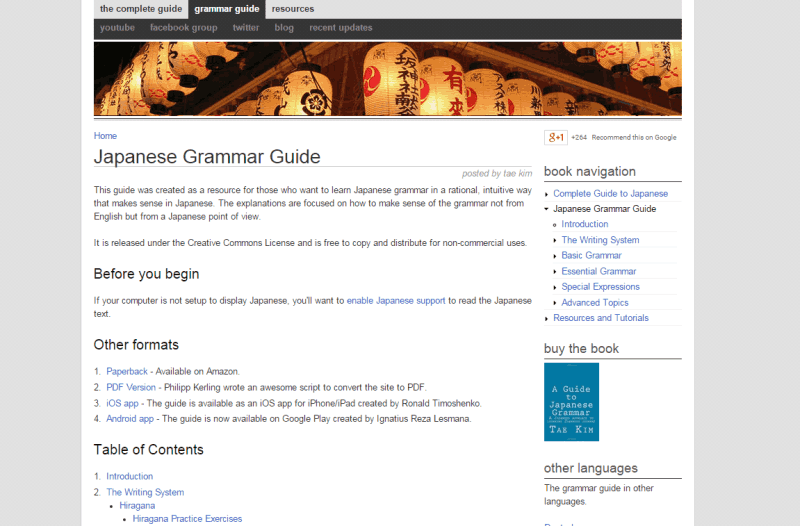 Grammar guide: This module is a perfect place to learn Japanese grammar. The resource will give you in-depth knowledge of basic, as well as advanced Japanese grammar. Go through this awesome website to learn Japanese with interesting videos, and audio. 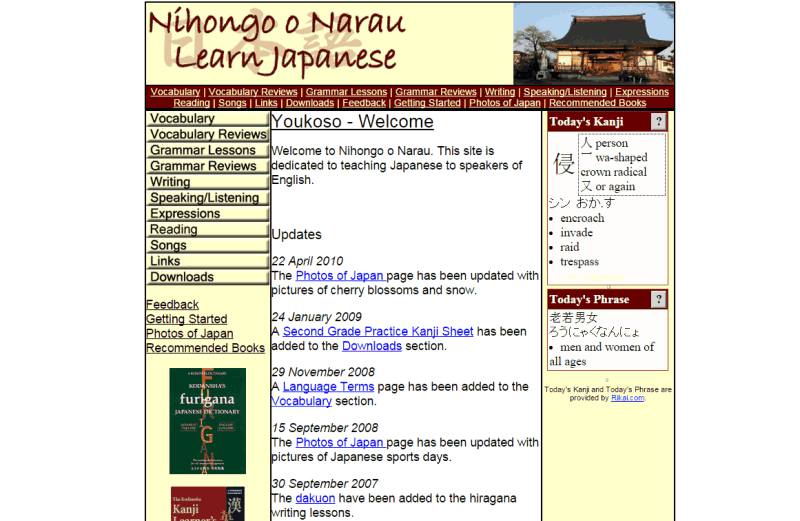 Nihongo O Narau is another exclusive website to teach you Japanese. 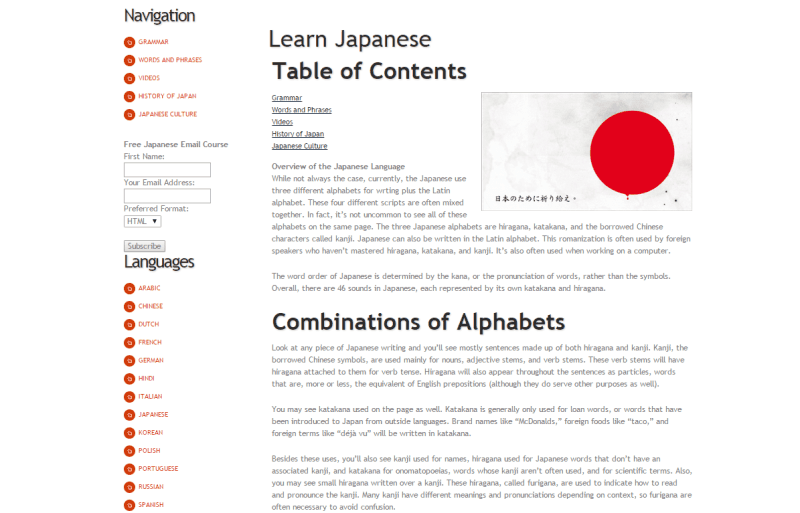 This free website to learn Japanese is quite interesting with a number of lessons. Study Japanese Grammar, learn Japanese Vocabulary, learn to read, write, and speak Japanese on this website. 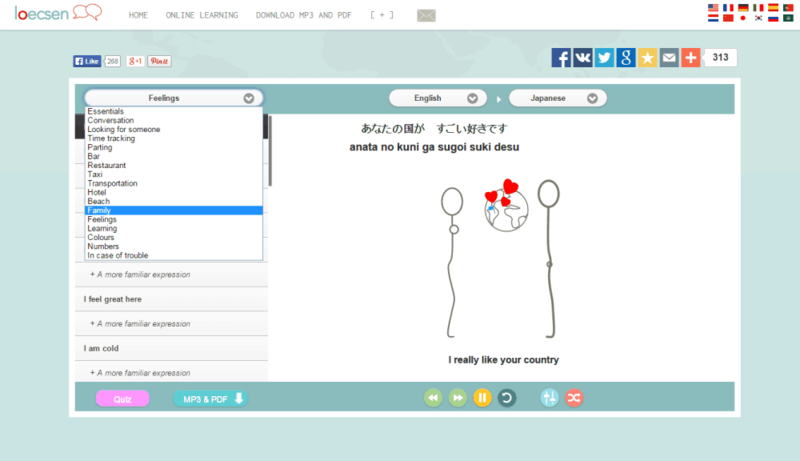 You can also learn popular phrases, expressions, and listen to Japanese songs as well. 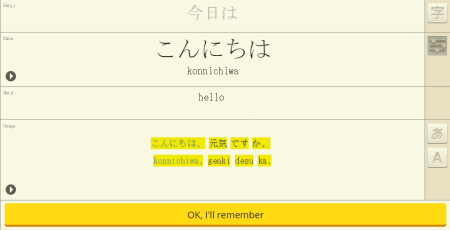 Characters: Learn Japanese characters, like: Hiragana, Katakana, Kanji, and Romaji. Dates & Time: Teaches you Japanese translation of Weekdays, Month dates, Time in hours and minutes. Existence verbs: Learn how and where to use verbs in Japanese. Adjectives & Descriptions: Learn to use adverbs in basic and advanced situations of speech. Verb Conjugation: Usage of Verbs, conjugation, etc. Formality: Know the difference between polite and casual way speech in Japanese language. The course is completely text based, and there's no audio available. However, it manages to teach you Japanese quite efficiently. 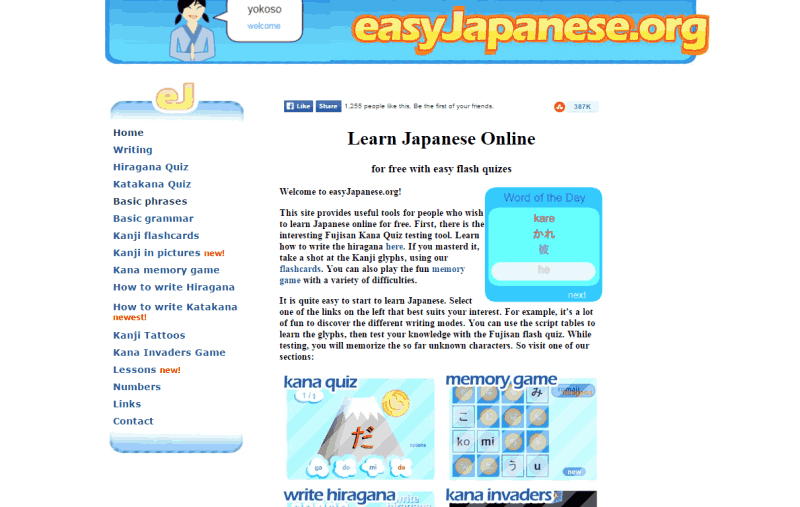 EasyJapanese.org is a very basic website, where you can learn basics of Japanese language. 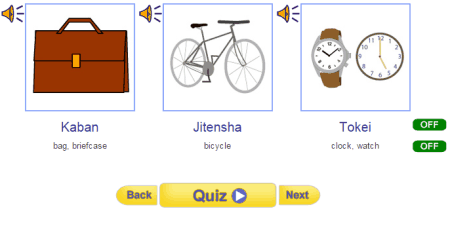 Along with different lessons in Japanese language, you will also find various Flash Quizzes. The lessons include: Writing, Phrases, Grammar, Numbers, etc. 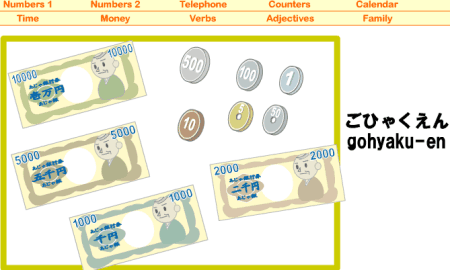 Memory games, quizzes, and flash cards make this website very interesting one to learn Japanese. 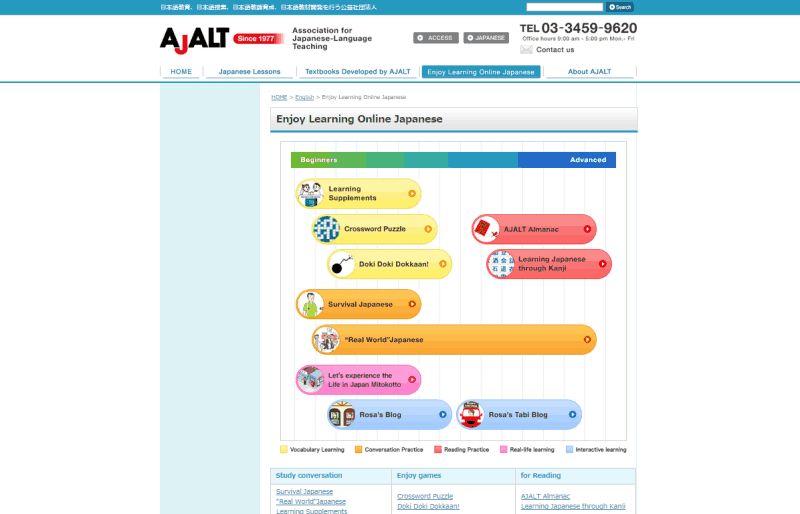 The AJALT (Association for Japanese Language Teaching) website has a free course to teach you Japanese language. The course is named Enjoy Learning Online Japanese, and has 10 lessons. The lessons are rated from Beginners level to Advanced level. These lessons in Japanese focus on Japanese vocabulary, Conversation Phrases, Reading, Real-life learning, and Interactive learning. 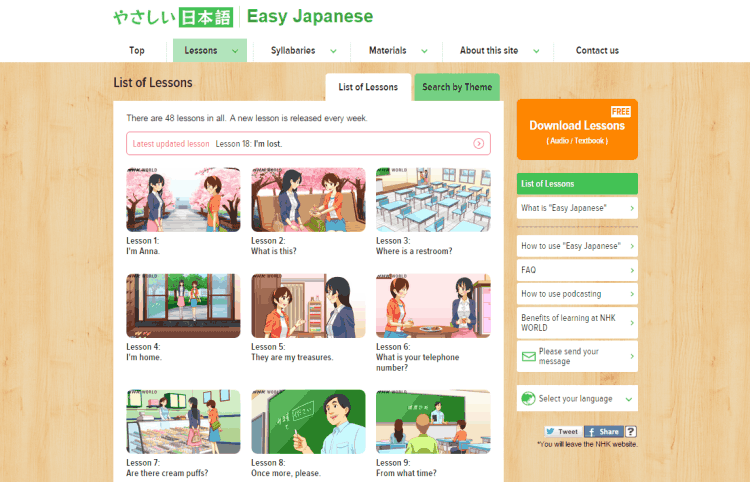 You can also take few quizzes, or read a Japanese learning blog linked to the website. NHK World is one of the best places to learn Japanese language. The Japanese learning course is based on conversations that happens with an International Student who visits Japan to learn Japanese. The course is divided in various lessons. 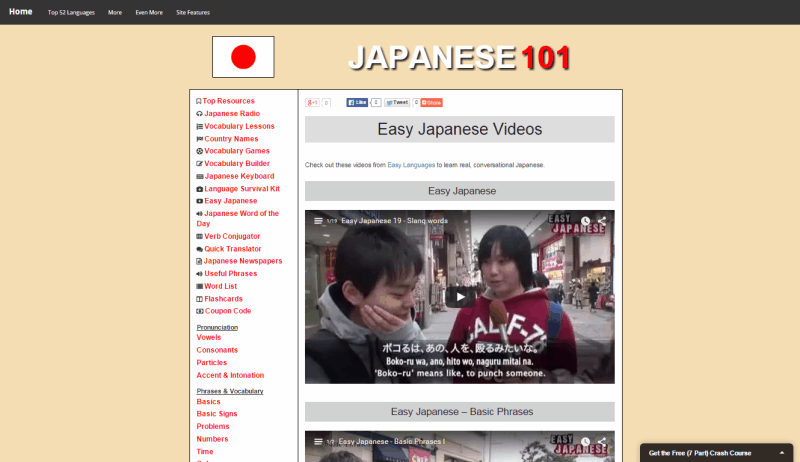 Each lesson has animated video, audio, and key phrases to help you learn Japanese even better. This is one of the most creative website to learn Japanese online. This course has 18 lessons on the website as of now, and more lessons are to be posted soon. 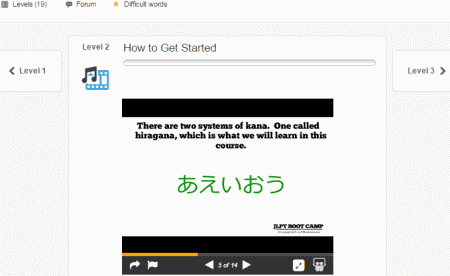 Erin's Challenge is a video based course to learn Japanese language. The videos are about a girl Erin from UK, who came to Japan and learnt Japanese. The course has 25 video lessons, which take you through different conversation situations. You can view the subtitles of the video as well. There are other sections, and language tools available on this website as well. TheJapanesePage.com is another free website to Learn Japanese for free. 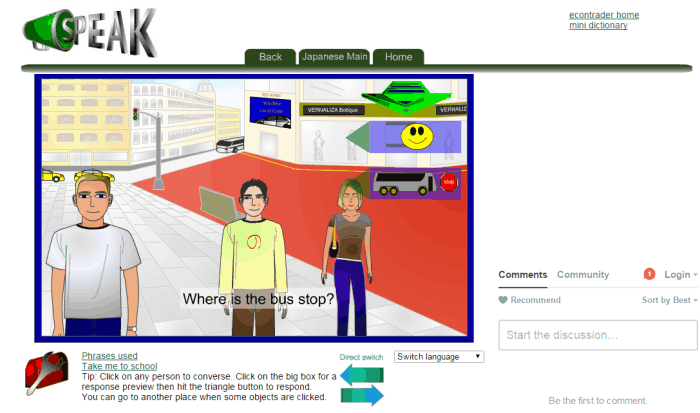 The website has language learning resources for beginners, and every other level of learners. 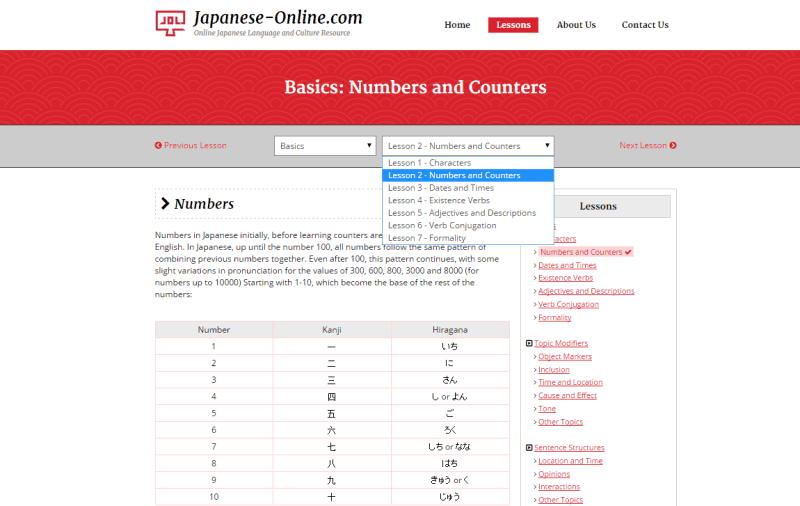 Go to the basic section, and start learning from Japanese characters. Move on to other advances lessons in an audio supported environment. Apart from basic course, you will find Educational videos, podcasts, ebooks, games, quizzes, and much more. 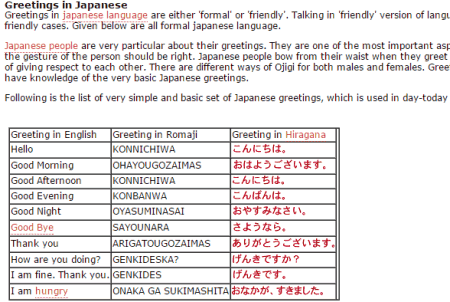 Before beginning the Japanese language course, do not forget to go through the introduction to Japanese language. With 9 lessons in japanese langauge, Learn-Japanese-Adventure.com is a pretty decent source to learn Japanese online. The course begins with an introduction to the course and Japanese language. Things you will get to learn here: Japanese characters, Basic and intermediate Japanese lessons, numbers, Words, Phrases, Speaking and Writing Japanese. At the completion of the course, you can also take a test. The lack of audio does not makes this website any less interesting or helpful. 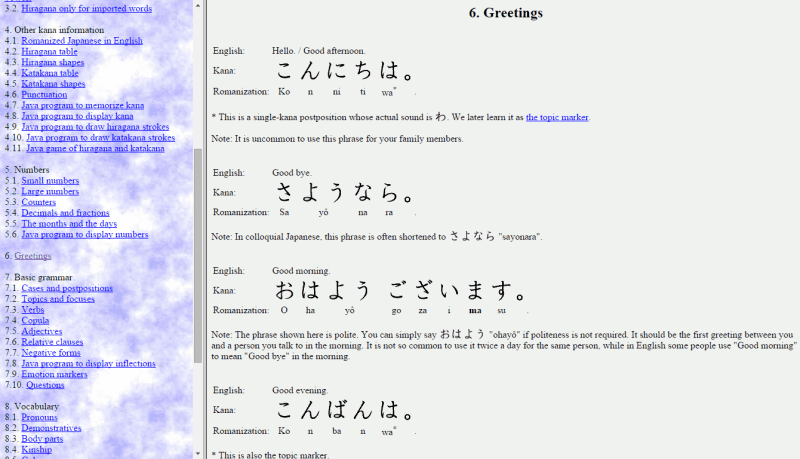 A very good website which teaches you to read and write Japanese easily. The audio support helps a lot with learning Japanese language. 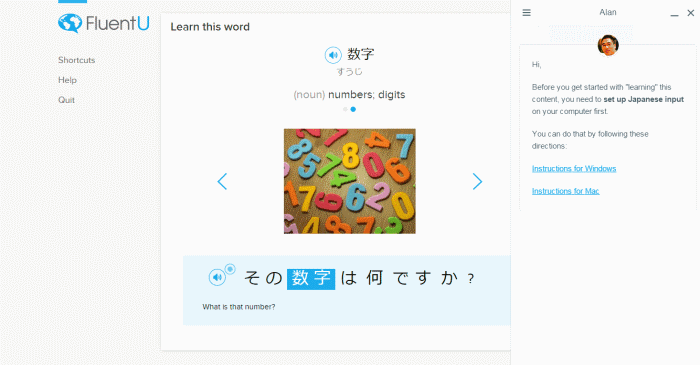 Cooori is another free language learning website to learn Japanese. Before you start learning, you have to register on this website. Chose your level of knowledge in Japanese, and begin learning. 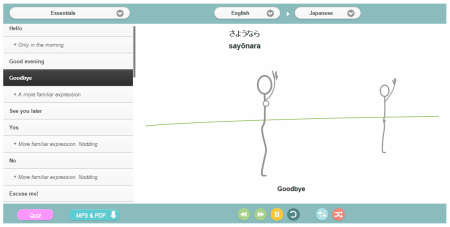 The course is based on flashcards; you will be given a series of words with their Japanese translation, and audio. 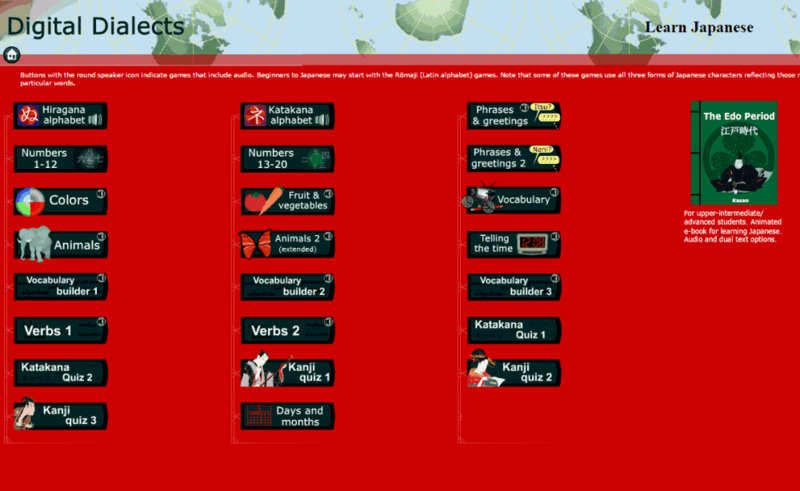 There are other language tools as well on this website: Quizzes, Stories, and language games. The best part is that you can also track your progress. 123Japanese is another decent place to learn basic Japanese. The Japanese learning course on this website has 8 lessons. Each lesson is later divided into various topics. Few of these lessons are supported by audio playback, and few are totally textual lessons. 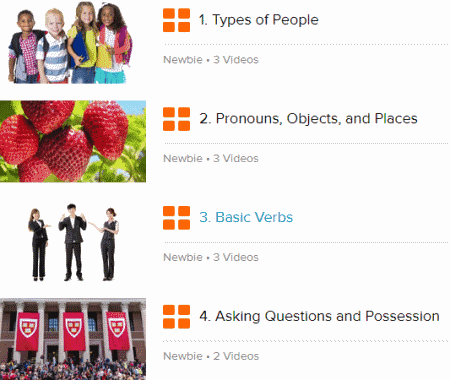 Each lesson covers different topics, and they have phrases related to the topic explained. 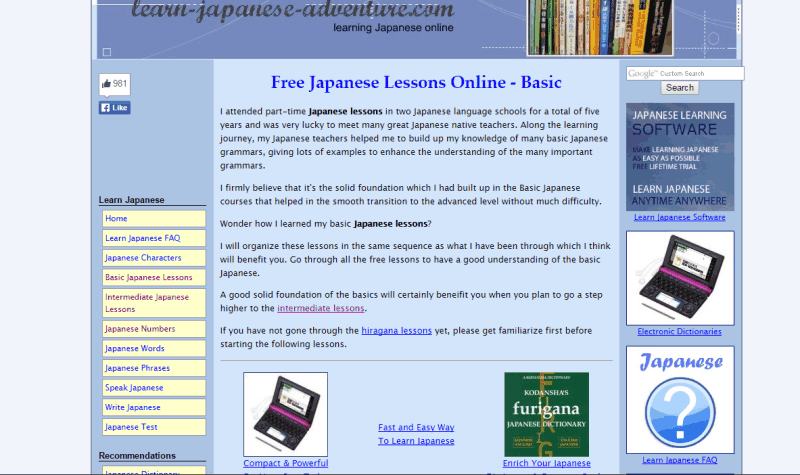 Learn Japanese Free has a vast collection of Japanese learning material. The course is divided in to 4 levels. The course starts with Japanese characters, Vocabulary, pronunciation, and phrases. There are various conversation based lessons to teach you conversations that might happen at a given situations. The course lacks audio support, however, is a capable tutor of Japanese language. Lentil offers 11 lessons to learn Japanese language. These lessons are good source to build a strong base in Japanese language. These lessons will teach you Japanese Characters: Katakana, and Hiragana, Kanji words, days of week, basic words of nature, names, and much more. The lessons are based on flashcards, and audio.